Jack will have a selection of his drawings and his story published this autumn, with all proceeds going to the Sick Kids Hospital. A six-year-old artist who became an internet sensation by drawing pictures on request has signed a book deal. Jack Henderson has raised almost £17,000 for charity through his website Jack Draws Anything where he draws whatever his supporters ask for. After just two weeks, the young artist from Prestonpans, East Lothian, had to stop taking requests as he works his way through the 600 commissions. 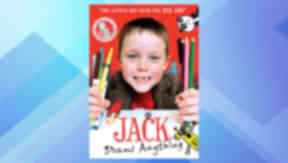 Now a selection of Jack’s drawings will be published in a book along with his story. All proceeds from the sale of the books will go to the Sick Kids Hospital where Jack’s little brother Noah, one, is regularly treated. Sara O’Connor, Senior Editorial Manager at publishers Hodder, said: “I found out about the project one week in through Facebook. A friend of my 'liked' it and I clicked on her link. Jack’s Dad, Ed Henderson, said the family were overwhelmed by the support they have had and want to raise as much money as they can for the hospital. Maureen Harrison, Chief Executive of The Sick Kids’ Friends Foundation, said they were “thrilled” that the Henderson family had raised so much for them. She said: “Little did we know when Jack decided that he would do drawings for friends to raise funds for the Sick Kids’ Friends Foundation, to thank staff at the children's hospital in Edinburgh for the care that his little brother Noah has had, that Jack Draws Anything would become an Internet phenomenon and now a book, published by such a prestigious company as Hodder. Jack has had help from his two little brothers, Toby and Noah as he has scribbled his way through the pictures requests. The book will be published 6th October 2011.